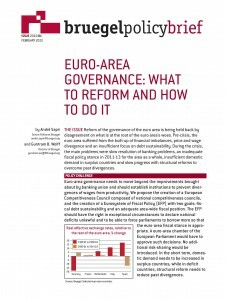 The Issue: Reform of the governance of the euro area is being held back by disagreement on what is at the root of the euro area’s woes. Pre-crisis, the euro area suffered from the built-up of financial imbalances, price and wage divergence and an insufficient focus on debt sustainability. During the crisis, the main problems were slow resolution of banking problems, an inadequate fiscal policy stance in 2011-13 for the area as a whole, insufficient domestic demand in surplus countries and slow progress with structural reforms to overcome past divergences. 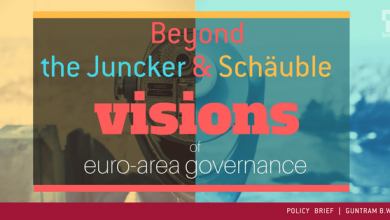 Policy Challenge: Euro-area governance needs to move beyond the improvements brought about by banking union and should establish institutions to prevent divergences of wages from productivity. 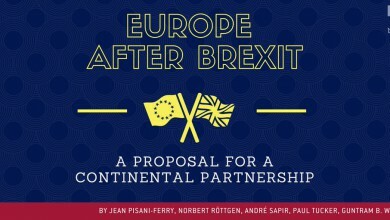 We propose the creation of a European Competitiveness Council composed of national competitiveness councils, and the creation of a Eurosystem of Fiscal Policy (EFP) with two goals: fiscal debt sustainability and an adequate area-wide fiscal position. The EFP should have the right in exceptional circumstances to declare national deficits unlawful and to be able to force parliaments to borrow more so that the euro-area fiscal stance is appropriate. A euro-area chamber of the European Parliament would have to approve such decisions. No additional risk-sharing would be introduced. In the short term, domestic demand needs to be increased in surplus countries, while in deficit countries, structural reform needs to reduce past divergences.